Riverlawn Cemetery River Road entrance. Niches are available for purchase in our new octagonal columbarium. Please note that special sized urns must be used for niches. See below for more details regarding urns. *Wood containers are made of white oak with a clear coat or natural stain with a clear coat. The chapel at Riverlawn Cemetery. Contact our Department of Public Service to reserve for more information at (810) 364-8340. 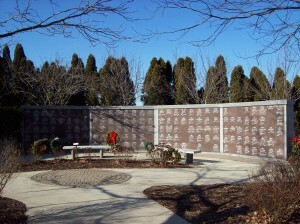 The City of Marysville (“City”), through its City Council, administers the Marysville Riverlawn Cemetery located on River Road (hereinafter the “Cemetery”) and the Marysville Riverlawn Columbarium located within the Cemetery (hereinafter the “Columbarium”). The City has adopted these rules and regulations to provide maximum protection to burial space owners and to best insure and preserve the beauty, orderly development, and care of the Cemetery and Columbarium. 1. The City Clerk shall keep the official records for the Cemetery and Columbarium. 2. Any person desirous of making a donation to the Cemetery or Columbarium should contact the City Manager or his or her designee. 3. The City reserves the right to make exceptions, suspensions or modification of any of these Rules and Regulations without notice, when in the judgment of the City Council such action is necessary. Any such exception, suspension or modification shall in no way be construed as affecting the general application of the Rules and Regulations. 4. The City expressly reserves the right to revise, change or alter these rules and regulations without notice. 1. CEMETERY LOT: The term lot is an area of sufficient size to accommodate an internment. 2. MARKER: A marker is a stone or plaque flush with the surface of the ground indicating the given and/or family names(s). 3. OWNER: The term Owner shall mean the person who is to be interred in the Cemetery Lot or Columbarium Niche. The owner may or may not be the person purchasing the lot or niche. 1. 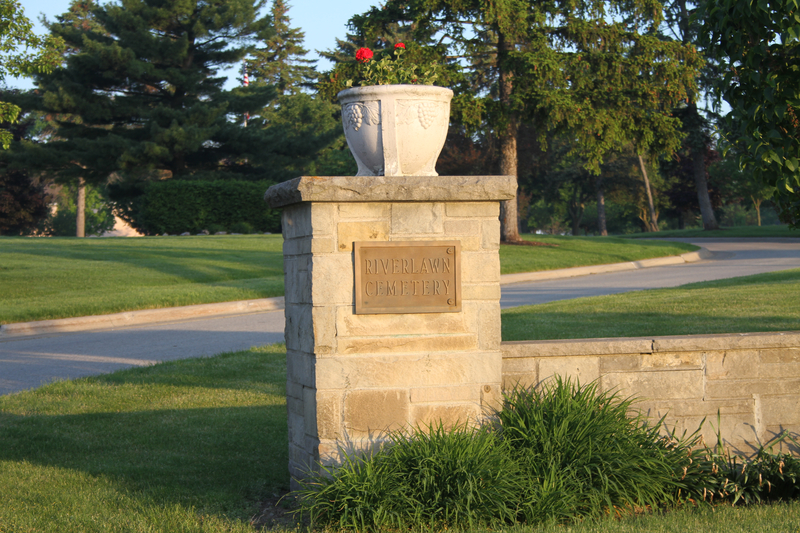 All persons are welcome to visit the Cemetery or Columbarium during daylight hours. Children under 12 years of age must be accompanied by an adult. Visitors may receive information and assistance from the Department of Public Services or the City Clerk’s office in City Hall during regular working hours. No person shall use Cemetery grounds for any business activity. The placing of signs, notices or advertisements of any kind, peddling or soliciting, and the sale of any commodity in the Cemetery are prohibited. Meetings, gatherings or assemblies of any kind in the Cemetery is prohibited, except as part of a funeral or memorial service. 2. No person shall engage in any fight, quarrel or disturbance in the Cemetery. No person shall loiter in the cemetery or fail to leave the cemetery after having been directed to do so by an employee of the city. No person shall interrupt or disturb any funeral or memorial service. Strangers are not allowed to approach the grave during a funeral and visitors are expected to be orderly at all times. 3. No domestic animals of any kind shall be allowed within the Cemetery grounds. This provision shall not apply to dogs assisting persons with disabilities. 4. No bicycles, motorcycles, cars, trucks or other vehicles are permitted in the Cemetery, except as may be in attendance at funerals, visitation or other cemetery business. No recreational vehicles are to be operated within the cemetery. To produce a natural and pleasing effect and to insure proper drainage to the ground, the grade of all lots and graves shall be determined by the City Engineer, and if need be, may be changed as the conditions require. Maintenance, grading and digging on Cemetery lots by other than City employees under the direction of the Department of Public Services may not be done. 5. The use of wooden rough boxes and concrete rough boxes is prohibited. All vaults must be sealed. At the time of burial and for a period of five (5) days thereafter, provided, no unsightly conditions results. a. For ten (10) days prior and ten (10) days following the observed Memorial Day. b. Winter wreaths on stands (no grave blankets) will be allowed for the period between November 1 and April 1.
c. There shall be no planting of any flowers, shrubs, vines or trees in the Cemetery except by the City. No fences, railing or other obstructions may be erected on any lot. 7. Within five days following Memorial Day, the individual group or organization placing flags in the Cemetery shall remove the flags and store them off Cemetery property. If any flag is not removed within that time period, City staff may remove it. Any flag so removed shall be kept in a safe location at each Cemetery maintenance building. 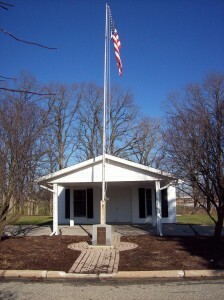 The individual, group or organization originally placing the flag may pick it up at the maintenance building. Within one week after July 5, all flags left on Cemetery grounds shall be collected by City staff and City staff shall return them to the group or organization responsible for original placement of the flags. No flags will be delivered to individuals. 8. Indigent burials are limited to City residents only and shall be paid at the rate set by the State of Michigan. Any charges for overtime or holidays as adopted by the Marysville City Council shall apply in full. 9. Any and all articles such as vases, flowers, markers and wreaths that are not flush with the ground will be removed by Cemetery attendants, except as permitted herein. When articles are removed from a grave by Cemetery attendants, no responsibility for damage or for their return will be assumed by the City of Marysville. Any person causing damage within the Cemetery shall be liable to the City for the cost of restoring the condition of the Cemetery. 1. Every Cemetery Lot is sold subject to these rules and regulations and any subsequent changes made by the City Council. All lots shall be sold on a perpetual care basis. 2. Upon purchase of a Cemetery Lot, the purchaser will be issued a Burial Rights Certificate for the Cemetery Lot. Each Burial Rights Certificate will identify the Purchaser and Owner (not necessarily the purchaser) of the Lot. No person other than the Owner may be buried on the Lot, except as may be provided herein. No person may be the Owner of more than one Cemetery Lot. The price of Cemetery Lots and opening and closing charges shall be adopted by the City Council and changed as deemed necessary. For purchase of lots, please contact the Department of Public Services or the City Clerk’s office, during regular working hours. 3. Persons purchasing a Cemetery Lot at the resident rate must prove the Owner is a resident of the City of Marysville at the time of purchase. 4. The Owner of a Burial Rights Certificate for a Cemetery Lot may NOT transfer the Burial Rights Certificate to another person, except as provided herein. An Owner may request a transfer of a Burial Rights Certificate for a Cemetery Lot on forms to be provided by the City Clerk’s office. All requests for transfer must identify the person to whom the Burial Rights Certificate is going to be transferred. The requests for transfer must be notarized and include payment of a $25.00 transfer fee. (The amount of this fee will be reviewed annually by the City Council and may be adjusted through the City’s Schedule of Fees.) Additionally, if the Lot was initially purchased at the resident rate and is being transferred to a non-resident, the request for transfer must include a fee equal to the difference between the resident and non-resident rates, then in effect. 5. In the case of a person wanting to trade a currently owned Cemetery Lot for a Columbarium Niche, the current price of the Lot will be applied toward the purchase of the niche. However, there will be no refund of monies paid. 6. When the Owner of a Cemetery Lot is a non-resident at the time the Lot was purchased, and later becomes a resident of the City; no refund of the price difference will be given. 7. The City reserves the right to repurchase any and all Burial Rights Certificate for a Cemetery Lot at the original purchase price. 8. Cemetery Lots purchased after the adoption of these rules will revert to the City if such have not been used within fifty (50) years of issuance of the Burial Rights Certificate. No such reversion shall occur, however, until the City has sent written notice to the Owner’s last known address as set forth in the City records. SUCH NOTICE WILL BE SENT AT LEAST SIXTY DAYS PRIOR TO THE DATE OF REVERSION. IF THE OWNER OF THE LOT NOTIFIES THE CITY CLERK IN WRITING WITHIN SIXTY DAYS FROM THE CITY’S MAILING OF THE AFOREMENTIONED NOTICE THAT HE OR SHE STILL INTENDS TO USE THE BURIAL RIGHTS CERTIFICATE, THE REVERSION OF SUCH LOT WILL BE EXTENDED FOR ANOTHER FIFTY (50) YEAR PERIOD. IF THE CITY DOES NOT RECEIVE THIS WRITTEN NOTIFICATION, THE CEMETERY LOT SHALL REVERT BACK TO THE CITY. All Burial Rights Certificates for Cemetery Lots are issued subject to this right of reversion and the City’s reservation of a perpetual right of ingress and egress over lots for the purpose of operation and maintenance. 9. Owners are responsible for notifying the City Clerk of any change in address. 10. Burial Rights Certificates for Cemetery Lots are exempt from property taxes and cannot be seized on execution. No mortgage or other encumbrance can be given on any burial right. 11. THERE SHALL BE NO DEFERRED PAYMENT PLAN FOR THE PURCHASE OF CEMETERY LOTS. 1. Every Columbarium niche is sold subject to these rules and regulations and any subsequent changes made by the City Council. All niches shall be sold on a perpetual care basis. 2. Upon purchase of a Columbarium niche, the purchaser will be issued a Burial Rights Certificate for the Cemetery Lot. Each Burial Rights Certificate will identify the Owner (not necessarily the purchaser) of the Niche. No person may be the Owner of more than one Columbarium niche. 3. The price of a Columbarium niche and opening and closing charges shall be adopted by the City Council and changed as deemed necessary. For purchase of niches, please contact the Department of Public Services or the City Clerk’s office, during regular working hours. 4. Persons purchasing a Columbarium niche at the resident rate must prove the Owner is a resident of the City of Marysville at the time of purchase. The Owner of a Burial Rights Certificate for a Columbarium niche may NOT transfer the Burial Rights Certificate to another person, except as provided herein. An Owner may request a transfer of a Burial Rights Certificate for a Columbarium niche on forms to be provided by the City Clerk’s office. All requests for transfer must identify the person to whom the Burial Rights Certificate is going to be transferred. The requests for transfer must be notarized and include payment of a $25.00 transfer fee. (The amount of this fee will be reviewed annually by the City Council and may be adjusted through the City’s Schedule of Fees.) Additionally, if the niche was initially purchased at the resident rate and is being transferred to a non-resident, the request for transfer must include a fee equal to the difference between the resident and non-resident rates, then in effect. However, once a niche is engraved, the Burial Rights Certificate for the niche may not be returned or re-sold to the City. The City reserves the right to repurchase any and all Burial Rights Certificates for a Columbarium niche at the original purchase price. 5. When the Owner of a Columbarium niche is a non-resident at the time the niche was purchased, and later becomes a resident of the City, no refund of the price difference will be given. 6. Columbarium niches purchased after adoption of these rules will revert to the City if such have not been used within fifty (50) years of issuance of the Burial Rights Certificate. No such reversion shall occur, however, until the City has sent written notice to the owner’s last known address as set forth in the City records. SUCH NOTICE WILL BE SENT AT LEAST SIXTY DAYS PRIOR TO THE DATE OF REVERSION. IF THE OWNER OF THE LOT NOTIFIES THE CITY CLERK IN WRITING WITHIN SIXTY DAYS FROM THE CITY’S MAILING OF THE AFOREMENTIONED NOTICE THAT HE OR SHE STILL INTENDS TO USE THE BURIAL RIGHTS CERTIFICATE, THE REVERSION OF SUCH NICHE WILL BE EXTENDED FOR ANOTHER FIFTY (50) YEAR PERIOD. IF THE CITY DOES NOT RECEIVE THIS WRITTEN NOTIFICATION, THE NICHE SHALL REVERT BACK TO THE CITY. All Burial rights Certificates for columbarium niches are issued subject to this right of reversion and the City’s reservation of a perpetual right of ingress over lots for the purpose of operation and maintenance. Owners are responsible for notifying the City Clerk of any change in address. 7. Burial Rights Certificates for Columbarium niches are exempt from property taxes and cannot be seized on execution. No mortgage or other encumbrance can be given on any burial right. 8. There shall be no deferred payment plan for Columbarium niches. 1. No grave or niche shall be opened, except under the direction of the Department of Public Services Director or his or her designated employee. 2. All applications for burial shall be made to the Department of Public Services in time to allow at least eight (8) working hours to prepare the grave, and must be accompanied by a burial transit permit. All applications for interment shall be made to the Department of Public Services in time to allow at least four (4) working hours to prepare the niche. 3. Requests for burial or interment on weekends or any holiday must be made forty-eight (48) hours in advance unless directed by the County Health Department. 4. It shall be the responsibility of the funeral director to provide their own equipment and manpower when erecting tents, mats and skirting, and when adjusting lowering devices. All equipment and materials shall be safe and in such condition to reflect the sublimity of the occasion. 5. In storing or handling materials or supplies for funeral directors or monument suppliers, the City shall assume no liability for damage sustained to such materials or supplies from any cause. During a burial service, all work in the immediate vicinity by Cemetery employees and others shall be discontinued. The burial of all persons who have died of an infectious or contagious disease shall be conducted strictly in accordance with all applicable laws and regulations. 6. Not more than one body shall be buried in one grave, except in the case of a deceased parent and infant child, or the passing of two infant children at approximately the same time. Multiple cremations may be buried in one grave as space permits. 9. A maximum of two cremations may be interred in one niche. 30” x 18” on a single grave, 45” x 18” across two adjoining graves. All footstones shall be 12” x 24” in size. 2. Footstones shall be permitted for Eligible Veterans. 3. Footstones may be permitted when a Cemetery Lot is used for the burial of more than one person as provided in Section VI, Paragraph 8. Requests for such footstones must be made in writing to the Director of Public Services. Section 12. All niches shall be sold on a perpetual care basis. Price of Columbarium Niches, opening and closing costs, engraving costs and transfer costs shall be adopted by the City Council and changed as deemed necessary. For purchase of niches please contact the Department of Public Services or the City Clerk’s office, during regular working hours. A Chapel is available at the Marysville Cemetery – for anyone desiring to use this facility please contact the Department of Public Service.